Qantas will raise ticket prices for the second time in two months as it battles high fuel costs. The airline will increase its fuel surcharge on international flights by between $10 and $30 while domestic fares will rise by an average of about five per cent, including a $7 increase on a one-way fare between Sydney-Melbourne and a $10 hike on most other routes. The new surcharges go into effect on April 5 for domestic flights and April 12 for international routes. 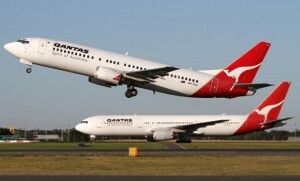 With average fuel prices for the financial year to date at their highest level since 2007-08, Qantas said it expects its fuel bill for the first six months of 2012 to rise to $2.25 billion from $1.95 billion over the same period last year. Qantas said it will also increase the fuel surcharge on frequent flyer award tickets from $12 to $16 for domestic flights and from $20 to $30 for trans-Tasman flights. Jetstar will also increase fares on some routes within both its Singapore and Australian markets, the airline said. The last increase in the fuel surcharge, announced in early February, raised international fares by up to $60 and domestic fares by 2.5 per cent. Combining the effects of both increases, the fuel surcharge for a flight to the US has risen from $250 to $340, while fares between Sydney and Melbourne have grown from $117 to $129. As it did in February, Qantas said the latest round of fare hikes will not recover the cost of higher than expected fuel prices.